Roboticists are using the lessons of a 1930s human physiologist to build the world’s fastest walking robot. Runbot is a self-learning, dynamic robot, which has been built around the theories of Nikolai Bernstein. “Getting a robot to walk like a human requires a dynamic machine,” said Professor Florentin Woergoetter. Runbot is a small, biped robot which can move at speeds of more than three leg lengths per second, slightly slower than the fastest walking human. Bernstein said that animal movement was not under the total control of the brain but rather, “local circuits” did most of the command and control work. The brain was involved in the process of walking, he said, only when the understood parameters were altered, such as moving from one type of terrain to another, or dealing with uneven surfaces. The basic walking steps of Runbot, which has been built by scientists co-operating across Europe, are controlled by reflex information received by peripheral sensors on the joints and feet of the robot, as well as an accelerometer which monitors the pitch of the machine. These sensors pass data on to local neural loops – the equivalent of local circuits – which analyse the information and make adjustments to the gait of the robot in real time. Information from sensors is constantly created by the interaction of the robot with the terrain so that Runbot can adjust its step if there is a change in the environment. As the robot takes each step, control circuits ensure that the joints are not overstretched and that the next step begins. But if the robot encounters an obstacle, or a dramatic change in the terrain, such as a slope, then the higher level functions of the robot – the learning circuitries – are used. The latest findings of the robot research study are presented in the Public Library of Science Computational Biology journal. Four other scientists – Poramate Manoonpong, Tao Geng, Tomas Kulvicius and Bernd Porr – are also involved in the project, which has been running for the last four years. Professor Woergoetter, of the University of Gottingen, in Germany, said: “When Runbot first encounters a slope these low level control circuits ‘believe’ they can continue to walk up the slope without having to change anything. He said human walking was a dynamic process. “About half of the time during a gait cycle we are not doing anything, just falling forward. We are propelling ourselves over and over again – like releasing a spring. “In a robot, the difficulty lies in releasing the spring-like movement at the right moment in time – calculated in milliseconds – and to get the dampening right so that the robot does not fall forward and crash. “These parameters are very difficult to handle,” he said. Runbot walks in a very different way from robots like Asimo, star of the Honda TV adverts, said Prof Woergoetter. “They are kinematic walkers – they walk step by step and calculate every single angle, every millisecond. The first step in building Runbot was creating a biomechanical frame that could support passive walking patterns. Passive walkers can walk down a slope unaided, propelled by gravity and kept upright and moving through the correct mechanical physiology. He said Runbot learned from its mistakes, much in the same way as a human baby. “Babies use a lot of their brains to train local circuits but once they are trained they are fairly autonomous. “Only when it comes to more difficult things – such as a change of terrain – that’s when the brain steps in and says ‘now we are moving from ice to sand and I have to change something’. The principle was first discussed in the human nervous system by Russian physiologist Nikolai Bernstein. So using the information from its local circuits Runbot can walk on flat surfaces at speeds of more than three leg lengths per second. Prof Woergoetter said Runbot was able to learn new walking patterns after only a few trials. “If walking uphill, the gait becomes shorter, the robot’s upper body weight shifts forward,” he said. The key lesson from the study, he said, was that the nested loop design first proposed by Bernstein more than 70 years ago “worked and was efficient”. He said the challenge was now to make Runbot bigger, more adaptive and to better anticipate situations like change of terrain. The new findings fly in the face of many people’s assumptions about modern Britain. “There are so many myths about these eras, such as that we have dumbed down. But more of us are better educated now and are likely to enjoy reading,” he adds. A third of those asked chose “challenging literature” in order to seem well-read. Top of the list was JRR Tolkien’s Lord of the Rings, Leo Tolstoy’s War and Peace and Emily Bronte’s Wuthering Heights. Another big factor in recent years has been the coming of the “freebie” paper. People’s choice of reading matter has not changed significantly, according to Ms Strong, with people still enjoying the same “rattling good reads”, such as thrillers and suspense novels. But the way people read and write to communicate with each other has been revolutionised. “If we are talking about reading for pleasure, people now read on the internet, people read text messages and emails,” she says. “If reading is deciphering symbols, that is all reading. “All evidence shows that parents who encourage their children to read and are readers themselves, have children who become readers too and this will open all the doors that reading can open,” says Ms Strong. “Young people are seen to be reading less and playing more computer games – but they are also reading to play these games and creating a narrative of their own. The bonfire at Ballycraigy contains hundreds of tyres Fears are growing that serious health and environmental damage could be caused when a huge bonfire in Antrim is lit on 11 July. The bonfire on the Ballycraigy estate contains hundreds of rubber tyres and dwarfs nearby houses. However, loyalists at Stoneyford in Lisburn have exchanged the traditional bonfire for a medieval-style beacon. Resident Mark Harbinson said the beacon would be lit in a steel basket at the top of a 25ft support column. Ballycraigy residents said that apart from damage to the environment, they could also suffer from effect of toxic fumes from the burning tyres. Anne Blacker, of the DoE’s Environmental Crime Team, said the bonfires issue “had caused a lot of frustration”. She said lack of funding and difficulty in persuading witnesses to come forward “made it increasingly difficult for her organisation to bring people before the courts for burning tyres and pallets on eleventh night bonfires”. Ulster Unionist councillor Drew Ritchie said they would work to ensure next year’s fire would be tyre-free. The SDLP’s Thomas Burns said the was extremely dangerous “not only for those in its immediate vicinity but also for the environment”. “It is even more shocking that certain people are intimidating council workers and those who want to see the bonfire removed,” he said. Mark Harbinson said the Stoneyford beacon was a “genuine attempt to move away from the traditional bonfire”. “It’s the only one in Northern Ireland at the moment but I’m hoping the idea will spread in coming years,” he said. Bonfires are lit on 11 July to celebrate loyalist culture in towns across Northern Ireland. The video game world is gearing up for the E3 Expo – one of the biggest events in the gaming calendar. Although smaller than in previous years the three-day event will be a showcase of the latest and greatest in the gaming world. The focus in 2007 has shifted from hardware to games and attendees will expect to see previews and launches of some keenly-awaited titles. But, despite the revamp, some wonder if E3 is being eclipsed by other events. In 2006 the E3 show attracted more than 60,000 visitors to the LA conference centre where more than 400 companies showed their wares. In 2007 the event, which runs from 11-13 July, has moved to Santa Monica. Exhibitors are spread around a series of venues and the show has become invitation-only. It is now aimed at the industry’s professionals rather than the game-playing public. But, said Rob Fahey, editor of gamesindustry.biz, this downsizing may not have had the desired effect. “The new E3 is a very provincial event,” he said. “Formerly, E3 was the world’s games trade show – now it’s very distinctly North America’s games trade show. Phil Elliot, UK Editor of GameSpot, agreed that the revamp has changed E3 significantly. Many European game makers would avoid E3, said Mr Elliot, and instead were saving themselves for the Games Convention that takes place in Leipzig in late August. “It’s a public show which will surely take on the mantle of biggest show on the calendar,” he said. Mr Fahey said the fact that E3 had shrunk was a good thing. “It will focus more attention on the European show in Leipzig, and the Asian shows in Tokyo, Shanghai and Seoul, and should hopefully help to emphasise the importance of non-US markets. A separate event for the public, called the Entertainment for All Expo, will take place from 18-21 October in LA. In 2006 the big announcements at the show were about hardware – in particular Sony’s PlayStation 3 and the Nintendo Wii as these next generation consoles had yet to launch. However, in 2007 with all three next generation consoles now on shop shelves the focus has switched to games. In particular, this year industry watchers are looking for titles that harness the raw computer power of the PS3 and Xbox 360 consoles. One of the most eagerly anticipated games is Assassin’s Creed from Ubisoft for the PC, PlayStation 3 and Xbox 360. The game, set in the time of the Crusades, is gaining attention for its huge environments, life-like crowds that react to the player’s actions and the acrobatic way the main character gets around towns and villages. Another PS3/Xbox 360 title that is widely anticipated is Grand Theft Auto IV – the latest instalment in the best-selling franchise that lets players take on the role of a modern-day criminal. This instalment is based in a revamped Liberty City and follows the fortunes of career criminal Niko Bellic. Killzone, Guitar Hero III and Rockband are also expected to win attention at the show. Armagh are out of the All-Ireland Championship after Derry snatched a dramatic and controversial victory in the qualifier at Clones. Colin Devlin kept his head in a frantic period of stoppage-time to coolly shoot over the decisive point. Seconds earlier Armagh felt they should have had a free in front of the posts which could have put them ahead. Paddy Bradley was the top scorer of the match with five points for the victorious Oak Leafers. Derry boss Paddy Crozier hailed the manner in which his side responded after the defeat by Monaghan in the Ulster semi-final. “They took servere criticism over the last two weeks but 70 minutes of football does not make them bad players,” he said. “We showed a lot of character but this is just one qualifying match. We cannot lose the head. “We have got to get the players back down to earth. If you’re running Windows Vista and you want to enjoy EAX-enabled effects from your Creative Audigy sound card, get ready to shell out a ten-spot for the privilege to do so. Although initially reported that Creative was charging $9.99 for Vista drivers in general, a post by ZDNet’s Adrian Kingsley-Hughes was later updated to reflect that the surcharge was to enable the processing of EAX effects. In Windows Vista, Microsoft removed the Vendor Extension mechanism from Vista’s DirectSound implementation. With previous Windows Operating Systems, the Vendor Extension enabled the Sound Blaster Audigy to provide accelerated audio for DirectSound3D games. Without Creative ALchemy, most DirectSound games running in Vista will be reduced to stereo output without any EAX effects. Creative ALchemy (Audigy Edition) restores your Sound Blaster Audigy’s ability to process EAX effects, 3D surround sound, sampling rate conversion and hardware audio mixing for DirectSound3D games in Windows Vista. So in essence, you’re paying for a workaround to re-enable EAX effects in Windows Vista because Microsoft disabled the Vendor Extension mechanism. I’d be a little brassed off if I had to pay $10 more for something to work as advertised. After all is said and done, people might be wise to vote with their pocketbooks when it comes to a matter like this. Creative is pointing the finger at Microsoft and Microsoft’s probably not going to do anything about it. Ultimately, the consumer picks up the tab. The inevitable increase of biofuel production is predicted to have a negative impact on the economy and ecosystems of developing countries according to a key UN study released on 4 July. However, leading fleet management firm, Masterlease, warns that in order to avoid draining any one resource it is critical that a mix of environmentally-friendly fuels are used to ensure the sustainable and long-term success of biofuel. According to the report, co-written by the UN and the Food and Agriculture Organisation (FAO), food prices are predicted to rise between 20 and 50 percent in the next decade and the growth of fuel crops – made from grains, sugars and oilseed – will threaten the economies of food-importing countries and take land out of food production. The report has sparked further scare stories in the media. However, Robert Kingdom at Masterlease says that the UK can learn from this report and previous mistakes in order to keep this fuel sustainable. Masterlease’s Robert Kingdom said: “We have relied too heavily on fossil fuels for the past 30 or 40 years – this appears to be bringing the environment to its knees while supplies of these fuels are finite. Biofuel represents an excellent alternative to these and is certainly being backed by major manufacturers whose biofuel vehicles are not only cleaner but often more efficient than their petrol or diesel equivalents. “However, neither domestic energy providers nor vehicle manufacturers should see Biofuel as an end to all their problems as this will create an unreasonable strain on the farmers and nations that are expected to produce them. There is already evidence to suggest that forests are being cleared too quickly to provide land for growing crops. Hopefully we will have learned lessons from the past – approaching the production of biofuels in an unsustainable way won’t benefit anybody in the long-term. “The same goes for powering the national grid, for example. There is no way that you could rely solely on wind or solar power to provide the nation’s energy, but adding wind, solar and tidal power to the existing set-up will make energy creation cleaner and cheaper. Likewise their benefits should be applied to a range of uses, including both domestic and vehicle energy. Speaking at a press launch in central London, he said The Simpsons Movie was “a tribute to the art of hand-drawn animation, which is basically disappearing”. “All the animated movies these days are computer generated,” he said, adding that his film had been created in “the old-fashioned, clumsy, ‘erase it if you don’t do it right’ way”. “It’s not a CGI movie with a thousand perfect penguins dancing in unison,” he continued – a reference to Happy Feet, the winner of this year’s Oscar for best animated feature. Journalists at Wednesday’s preview were treated to a 10-minute excerpt showing many familiar characters. Scenes included naughty adolescent Bart Simpson skateboarding through the fictional town of Springfield naked and his intellectual sibling Lisa meeting a potential new boyfriend. Another sequence depicted US rock band Green Day being booed off stage for expressing green concerns – a suggestion the film will have a topical environmental theme. 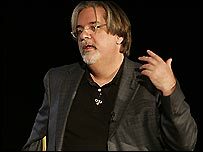 Groening, who first conceived The Simpsons in 1985, said the thinking behind the film was to include “everything we couldn’t show on television”. “We hope it makes a little money too,” joked executive producer Al Jean. The idea for a Simpsons film has been percolating since 1992, said Groening, but only came to fruition recently. “Finally we decided that, as we were coming up to our 20th year and 400th episode, we should have a movie out,” he said. According to Jean, however, it was not something into which they entered lightly. That said, Jean is keen to point out one does not have to have watched the programme to appreciate the movie. “Our ambition was if you’ve never heard of the Simpsons you can enjoy the film,” he said. Any suggestion that the belated film represents a winding down of the Simpsons franchise was hotly denied. “Emphatically no,” said Jean, adding that he hoped the film would “help the franchise and bring more people in”. Given the show has been running since 1987, it is unlikely there is anyone left who has not encountered America’s favourite nuclear family. 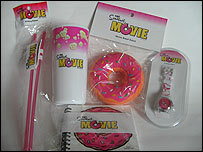 And with a goody-bag of merchandise awaiting journalists as they arrived for Wednesday’s event – including watches, drinking straws and even a stress relief aid shaped like a donut – the film is clearly viewed as a major summer cash cow. Would Groening and Jean like their inevitable box-office success to be followed by awards recognition? Perhaps, though for now they are happy to trot out the usual cliches. “It’d just be an honour to be nominated!” adds Groening with his tongue firmly in cheek. The Simpsons Movie is out in the UK on 27 July. the evening of the 12th July . July is to be welcomed. than to antagonise and to heighten community tensions. A spokesman for O2, which is owned by Spain’s Telefonica, declined to comment on the reports. More than 500,000 iPhones were sold in the first weekend in the US by AT&T, which has exclusive rights there. Vodafone had previously been tipped as the likely winner of the contract. The agreement with O2 is reported to include Apple receiving a continuing share of the revenue generated for the network operator. The handsets are expected to be sold for about £300 and O2 will be hoping that the lure of the fashionable phone is enough to win customers from rival networks.